The aim of this experiment is to find how resistance changes in a circuit containing bulbs in series or parallel and how they are related. For this experiment I will need knowledge of electricity and physics. A famous physicist Ohm made an important discovery. Known as Ohms law, from his discovery he stated that: ‘the current flowing through a conductor is directly proportional to the potential difference across its ends provided that the temperature is constant’. In equation form this is: R = V/I. From his discovery we are know able to work out the resistance of a circuit from knowing the voltage across the circuit and the current flowing (amps). After his discovery the units with which we measure resistance were named after him – Ohms, the symbol for which is the Greek letter omega (Ω). 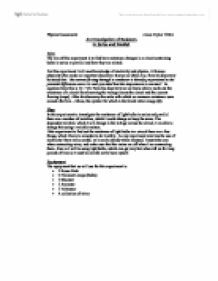 In this experiment to investigate the resistance of light bulbs in series and parallel there are a number of variables, which I could change or keep the same. The dependent variable, which I will change is the voltage across the circuit, I am able to change this using a variable resistor. On the whole this smaller experiment proves my prediction. As shown in the results table the two bulbs in series provides double the resistance of one bulb in series. 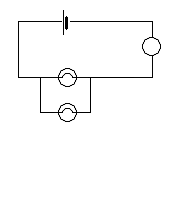 While the circuit with the two bulbs in parallel is halve the resistance than that of the one bulb in series circuit. Firstly I will set up the equipment for the experiments in series. I will start of with the voltage on the power pack set to twelve volts. I will then add one bulb to the circuit. I will use the variable resistor to find the reading of 0.6 amps flowing through the circuit. I will then record the voltage across the bulbs. Increasing the amperage each time till I reach 1.3 amps. 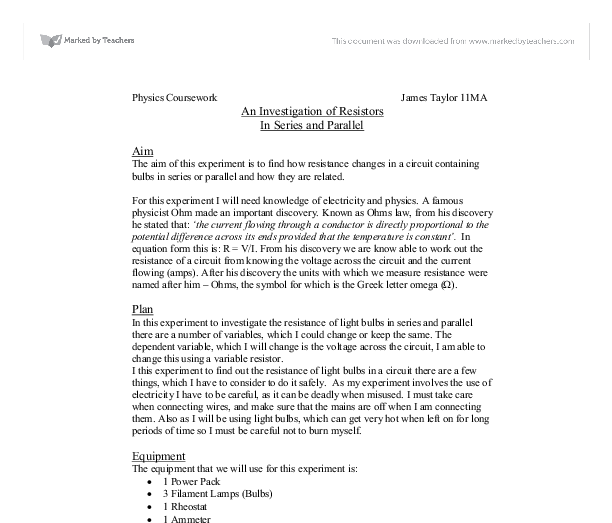 I shall then redo the experiment three times so I can work out an average reading and also to ensure accurate results. I shall then increase the number of bulbs to two in series and do the experiment again. Then I will do the same for two bulbs connected in parallel. The current flowing through the circuit, which I will be able to change using a variable resistor. The number of bulbs used. Whether the resistors are in series or parallel. A voltage of 12V flowing through the circuit. The type of wires used. Overall I think the experiment was carried out exceptionally well with very few errors. Also I did not record any unusual readings due to the fact that I checked the circuit was connected properly and I let the results stabilise before I took a reading. However, because I used non-ohmic bulbs there was a slight curve on the graph, this could have an effect on the reliability of my results. This could be avoided next time by using a set of ohmic bulbs to avoid getting the heating up and cooling curves on the resistance graph. From the results I am able to state a definite conclusion, which supported my prediction. My prediction stated, two resistors in series would double the resistance the current is held through each one and that two resistors in parallel should halve because the current is split between the resistors, through my results this is fully supported. However, I could extend the investigation I could add more bulbs in series and parallel circuits to see if it still follows the pattern I discovered in this experiment. For example if I used three bulbs in series and parallel would it mean that they would be three times as big and a third of the control. Although the potential difference output from the lab pack fluctuated, I corrected this as best as I could before every reading was taken. The potential difference was correct to one hundred millivolts of the total output. The 1000 ohm variable resistor that I used actually was 996 ohms when I measured it after the experiment. decreasing due to the losses in the transformer with the leakage flux and also around the load. One of the differences between ideal and practical transformers are the losses in real transformers which entail a power input that is always slightly greater than the power output. 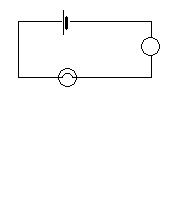 For a series circuit the total resistance is equivalent to the external resistance (R1) + internal resistance (r1) * 2. 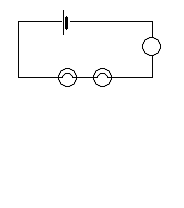 In a series circuit, I expected the internal resistance to be half of the series circuit with two cells -> 1* (r1). As power is equal current2 time's resistance. As the current increase twice, the power increase four times. In addition, the resistance of the LDR depends on the power of the light bulb, so as the current increase or decrease twice; the resistance of the LDR also increase or decrease twice. A way of reducing the effect of the heat losses, which remain, is to apply a cooling correction. In this experiment the temperature was recorded both during heating and after the heating as discontinued. The temperature was shown to vary in results two and three once the heat was discontinued, and the shapes of the graphs are as below. Also, if electricity is passed through two equally sized copper wires, each of varying temperatures, the heated wire will offer much more resistance when compared with the cooler one. This is because they are far away from the nucleus and thus can be used to carry charges more easily and so they are used. Covalent substances do not usually conduct electricity because the electrons are all shared between the substances and there are no extra or free electrons that can be used to carry charges.